McDonald's is appointing Publicis Groupe’s Starcom as the fast-food chain's media agency partner in Russia following a review. Sibling agency Leo Burnett has been a creative partner of McDonald’s in Russia for the past 11 years. The incumbent was OMD. "Our expertise and experience in working with clients to transform their data and digital practice, as well as our ability to apply that understanding to creative and media, give us the confidence that Starcom and Publicis Groupe will drive meaningful business outcomes for McDonald’s," stated Vladimir Tkachev, CEO Publicis Groupe Russia. 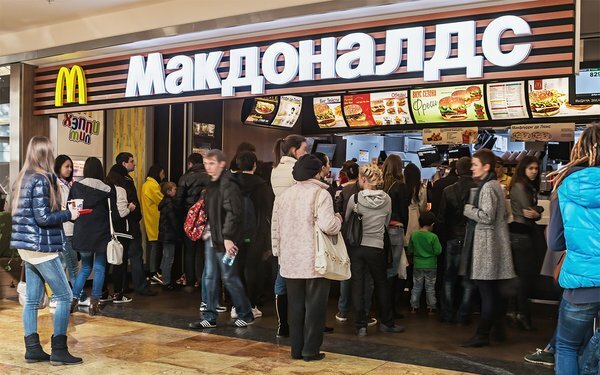 McDonald's remains extremely popular in Russia, despite the tense recent political relationship between the country and the U.S.
One way McDonald's has navigated this uncertain situation has been to center the chain locally. Last year, McDonald's started using Russian-grown potatoes and a Russian factory to make French fries, The Wall Street Journalreported at the time. The award is part of a market-by-global media agency review that McDonald’s has been conducting for over a year. In 2018, the company opted to retain OMD in China, the food chain’s fastest-growing market and currently third-largest market overall. The Omnicom Media Group agency has also been awarded Germany, while Starcom, part of Publicis Media, has won France. McDonald’s awarded both agencies parts of Latin America. 3 comments about "Starcom Wins McDonald's Russia". Jonathan Hutter from Northern Light Health, January 23, 2019 at 1:01 p.m. If you eat a Russian burger, are you guilty of collusion? John Grono from GAP Research, January 23, 2019 at 6:48 p.m. I did a McDonald's Scratch, Match & Win, and only got a free burger - not the whole national franchise. John Grono from GAP Research replied, January 23, 2019 at 6:49 p.m.
Jonathan - more likely guilty of cholesterol.